Following on from a successful pre Christmas race when lack of wind dictated the format of a very short course at the top of the river next to the club pontoon and in front of the club balcony. It occurred then to PRO Keith Willis that this could be a lot of fun in any wind and any direction. The lack of moored boats in the winter provides space for a tight race course and a series of 10 minute races with fast turnarounds. Crowds were depleted due to the very cold snap in the weather that weekend. 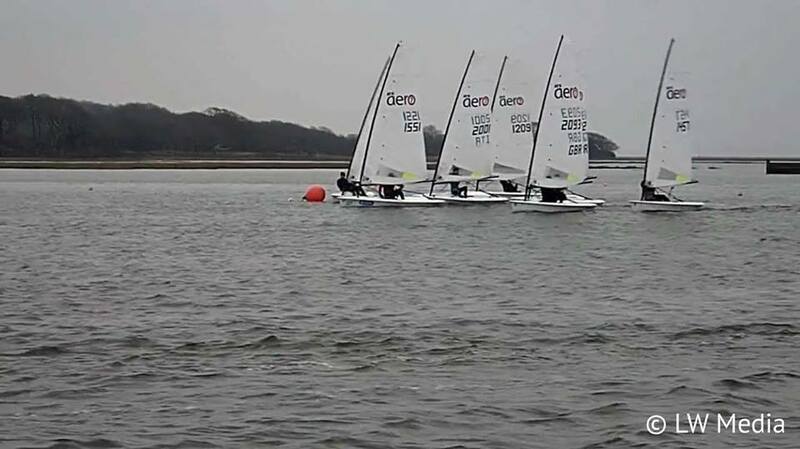 Even with the bitterly cold temperatures 7 hardy Lymington RS Aeros went out to hone their skills and brush off the winter cobwebs in time for the RS Aero UK Winter Champs the following weekend. The Lymington sailors invited their neighbours and whilst the cold and various logistics meant none took to the water three RS Aero sailors from neighbouring Highcliffe SC and Spinnaker SC came to spectate and see what they could pick up from watching with a grandstand viewpoint on the pontoon. The fleet all opted for their RS Aero 7 rigs to be matched and in the marginal planning medium breeze it was agreed unanimously at the briefing to relax Rule 42 on the downwind legs. This was a lifesaver in the cold air, keeping everyone toasty warm and great winter exercise too, with sailors panting by the leeward mark! This ‘experiment’ proved a real eye opener with useful learning on what was the most effective technique to make best use of a legal pump within normal racing. The starboard biased start line was offset by more wind for the leeward boats due to the adjacent shore line and plenty of opportunity for a wind shift later in the beat to make up for the initial bias. Five 12 minute races gave 5 starts, 33 mark roundings and all angles on the triangle/sausage course. 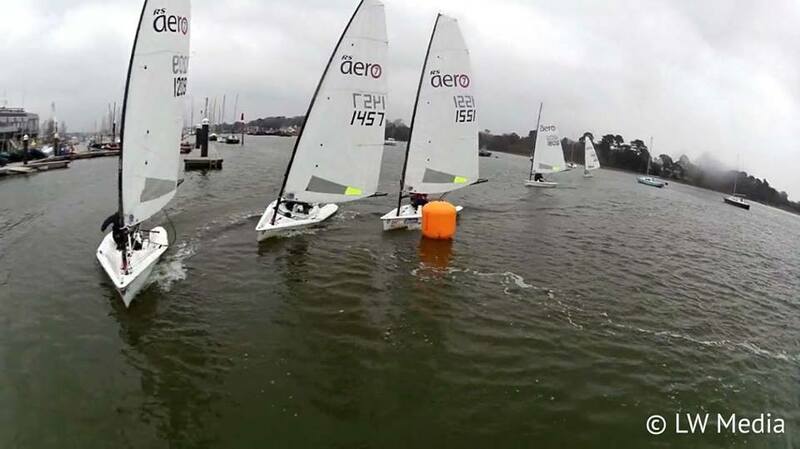 Sailors came ashore buzzing and the invigoration led immediately to two more Lymington sailors committing to travel to the RS Aero Winter Champs at Oxford the following weekend! With keen players and little organisation, time or resource required we now plan to run similar sessions periodically throughout the year. Regards the results – In fairness to Liam, he was busy laying the course when we had our briefing describing the course. He was comfortably leading race 1 when he sailed off in the wrong direction. However, it is best to learn these lessons in training like this!!! Demonstrating innovation akin to a BBC nature documentary, LW Media and their talented team were out following the racing. The crew were experimenting with some new camera mounts to get right in amongst the action. RS Aero Stadium Racing from LW Media on Vimeo.